General: Programs at Academy Four Paws are based on the individual temperament of each dog and owner’s preference of methods and equipment and the desired goals to be achieved. 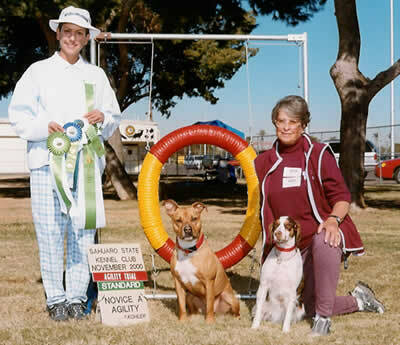 All lessons are private until the owner is proficient with the equipment and has control of his or her dog, after which they may join a class. 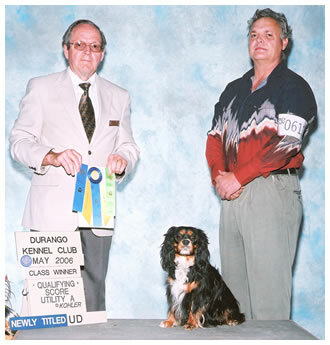 This insures that both dog and owner are comfortable and have reached required standards with minimal distractions. This also insures that all questions are answered on a constant basis and that the dog is showing rapid improvement, understanding each lesson. 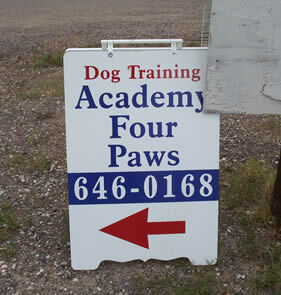 Appointments: We train dogs full time here at Academy Four Paws. Appointments are required. Prices: An evaluation is conducted at the first appointment so that the appropriate training program can be recommended and discussed. Prices depend on problems revealed during the evaluation. Group Class: Group class time is spent going through learned exercises with full distractions. 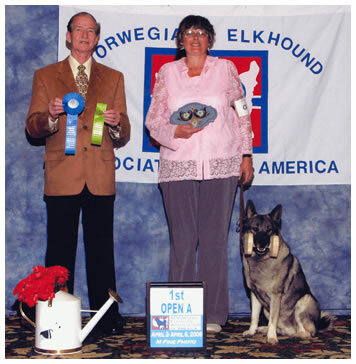 Owners are very impressed by how well their dogs perform around other dogs. Group classes are structured but flexible and students can come and go as they wish. 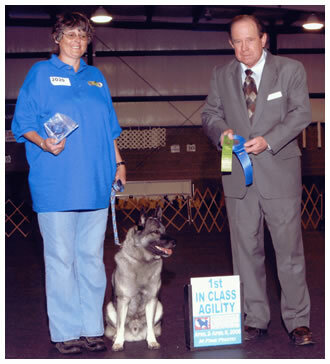 Private Lessons: The focus of private lessons is to show the owner how a dog thinks and learns. Special emphasis is placed on dogs of any age being safe to handle by Vets, Groomers, and the general public. Identification of Programs: There is no plagiarism. Each client is told who is the originator of the method they are using. We use all forms of equipment. Age and History: The age a dog can start a program is based on vaccinations. It is never safe for puppies to visit public areas until their vaccinations are complete. Old dogs are never too old to learn, although they may have physical limitations that need special consideration. We will be happy to discuss your special situation. Agility and Flyball: Agility has a waiting list. Phone in to have your name put on the list. Flyball is by Verde Valley Rapid Runners team approval. We do not train dogs for other teams. Gun Dog: Gun Dog training is available. We do not use live birds. Aggression Therapy: Aggressive dogs are evaluated with safety in mind. The evaluation process and outcome of training depends on the owner follow through. All owners of aggressive dogs are told that training is not a 100% guarantee of rehabilitation. Proper management of such a dog will remain a moral, legal, and ethical responsibility for its owner. Dog Care: Combined boarding and training is available at the Academy. Daycare is available for client’s dogs only. We have dog walkers for hire. Exercise yard, full size playroom and lessons are given if requested. Prices vary per request. Weekend Pick-up and Drop-off: You can deliver and pick-up you dogs on weekends! Our Regrets: We will recommend other trainers for Schutzhund. We do not train for protection work. Take 89A and turn right on the Cornville Road. Follow Cornville Road and turn left on South Page Springs Road. The facility is a brown log building on your left. Entrance and parking is at the rear of the building. It is approximately 1 block from Casey’s Corner. Take 89A towards Cottonwood. Turn left from 89A onto the Page Springs / Cornville turnoff. Follow Page Springs Road to 1050 South Page Springs Road. Facility is a brown log building on your right. Entrance and parking is at the rear of the building. From 179 take 7 mile road to Cornville Road. Turn right on Cornville Road. Turn right on Page Spring Road. The facility is a brown log building on your left. Entrance and parking is at the rear of the building. It is approximately 1 block from Casey’s Corner.